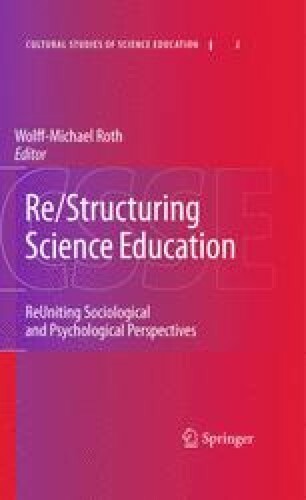 In a typical study of students’ conceptions and conceptual change, researchers analyze what a student does or says in a classroom or in an interview and recognizes ideas that match or do not match their own understanding of the topic. Attributing the perspective they recognize in the student, those studies support the idea that a conception is the way by means of which an individual intrinsically conceives (of) a given phenomenon. They then hypothesize the existence of some mental structures that can be theoretically and objectively re-constructed based on what is observed in a student’s performance. Thus, researchers studying conceptions commonly assume that the observer and the observed are separate entities. However, even in the most theoretical and hardest of all sciences, physics, the independence of the measured object and the measuring subject is not taken for granted: Light, for example, will present itself as waves or as particles depending on how we examine it. The artificial sense of separation from the object(s) of study found in many accounts on students’ conceptions makes irrelevant the relationship that exists between the observer and the observed: an interdependence and co-emergence of the observer and the observed. This tight relation exists because each participant not only reacts upon what others say but also acts upon the reactions that his/her own actions give rise to. With this situation come epistemological, practical, and ethical implications for those researching in mathematics and science education. Positing or questioning the existence of an objective reality mediates how we accept or reject another human being and the worldviews s/he develops. It provides a rationale that guides our actions. This is especially important when it comes to teaching and learning at a time where the ability to deal with the plurality and diversity of human culture have emerged as significant referents for our social behavior. This study was made possibly by two research grants (to JT and WMR, respectively) and a doctoral fellowship (to JFM) from the Social Sciences and Humanities Research Council of Canada. We thank the classroom teacher and children for participating; and we are grateful to Mijung Kim and Lilian Pozzer-Ardenghi for their assistance in the data collection.